Returning back to a ground where we had played a number of Spartan South Midland League fixtures over the years, we bounced back from our 9-1 drubbing by Hayes & Yeading be gaining a point from a 2-2 draw but it could have been so much better as we led 2-0 going into the final fifteen minutes of the game. The management team opted for a 3-5-2 formation with new signing Dan Julienne making his debut in midfield alongside Calum Duffy and Harvey Killeen whilst Keiran Cathline and Jack Waldren took up their wing back roles. Gareth Chendlik led the front line alongside Tom Collins, with Femi Azeez away playing Middlesex County FA Representative football. On quite a difficult playing surface both sides took a while to find their feet and it was not until the tenth minute of the game when either side carved out any real goal scoring opportunity. Our chance came when a good run and then through ball by Keiran Cathline found Tom Collins in space but his low shot could only find the side netting. At the other end, a cross to the far post by Hertford's Daniel Cheema looked like finding the far corner of our net but Jack Waldren was able to clear the danger. On the quarter hour mark, the home team's keeper, Charlie Mann, made an excellent save to turn Keiran's shot over the bar after an excellent run by Harvey Killeen and then from the resultant in swinging corner from Jack, Gareth Chendlik headed the ball against the Hertford crossbar before it was scrambled to safety. It was then our time to have a narrow escape at the other end when a floated free kick into our penalty area saw the ball headed goal wards and Aaron was beaten before we managed to clear from our goal line. Hertford were now enjoying a lot of possession and Julienne picked up the first yellow card of the afternoon as he pulled back a Hertford player. With five minutes of the half remaining, Aaron diving away low to his right turned a goal bound shot from Cheema around the post to keep us level and then right on the stroke of half time we took the lead. A long ball forward down the right was flicked on and Tom Collins finished superbly drilling a low shot across Mann into the far corner of the net. Buoyed on by this goal we dominated the game in the opening stages of the second half, during which Hertford made the first of their substitutions, George Lutaaya replacing Mulik Rickman. Despite our dominance we were unable to really test the Hertford keeper but we scored again in the sixty second minute to go two up. It was thanks to a long run by Harvey, who over the ninety minutes, was by far our best player. Finding space he surged forward before playing the ball into the path of Gareth who's immediate cross to the far post found Tom who headed home from close range. This goal resulted in Hertford making a double substitution Elliott Bailey and Theodore Costa coming on to replace Ben Ward-Cochrane and Brett O'Connor. The substitutions almost had an immediate effect as good work by Bailey down the left resulted in the ball reaching Lutaaya out on the right and his cross was turned into our net from close range but fortunately the linesman's flag was already raised when Lutaaya received the ball. However, our relief was very short lived as almost immediately, from a corner on the left by Macauley Joynes the ball was flicked on to an unmarked Mark Twumasi and his header somehow found the bottom corner of our net, evading the efforts of Aaron and Jack to clear the ball to safety. Hertford were now continually on the front foot as we retreated further and further towards our own goal line. We brought on fresh legs with Louis Bircham and Harry Rush replacing a limping Keiran and Tom. Hertford should have drawn level when Cheema from point blank range failed to turn a low cross by Lutaaya home. A long cross/shot by Hertford's Jay Lovell then hit the top of our crossbar. As the minutes ticked away, our hopes of hanging onto the three points rose but it was not to me. During this final period of the game, the tall Lovell had launched a succession of long throws into our penalty area and from one of these, Will Wambeek right under the referee's nose pushed Charlie Edwards and a spot kick was awarded. Bailey made no mistake from the resultant kick sending Aaron the wrong way. In the five minutes additional time there was more drama with Harry just failing to get onto the end of a low cross by Harry and then in virtually the last incident of the game, Calum who worked tirelessly all afternoon, came to our rescue as he headed home Lovell's header off the goal line with Aaron beaten. Hanwell Town. Aaron Bufton, Keiran Cathline, Jack Waldren, Oliver Duffy (c), Harry Tamplin, Will Wambeek, Dan Julienne, Calum Duffy, Gareth Chendlik, Tom Collins and Harvey Killeen. Subs used Louis Bircham for Cathline (77) and Harry Rush for Collins (79). Unused subs Wayne Carter, Brian Testolin and Annis Nuur. Hertford Town. 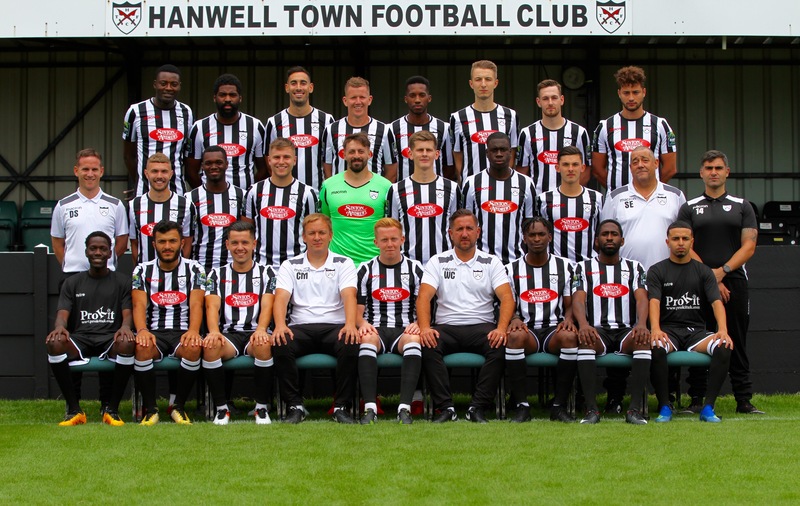 Charlie Mann, Jordan Lawal, Macauley Joynes, Ahmed Mohammed.Jay Lovell, Mark Twumasi, Daniel Cheema,Charlie Edwards, Ben Ward-Cochrane, Brett O'Connor and Mulik Rickman. Subs used: George Lutaaya for Rickman , Elliott Bailey for O'Connor and Theodore Costa for Ward-Cochrane. Unused substitutes: Aaron Deveney and Jevon Campbell.